Typhoon Mangkhut barreled into southern China on Sunday after lashing the northern Philippines with strong winds and heavy rain that left at least 64 people dead and dozens more feared buried in a landslide. The Hong Kong Observatory warned people to stay away from the Victoria Harbour landmark, where storm surges battered the sandbag-reinforced waterfront. The storm made landfall in the Guangdong city of Taishan at 5 p.m., packing wind speeds of 100 miles per hour. State broadcaster CGTN reported that surging waves flooded a seaside hotel in the city of Shenzhen. 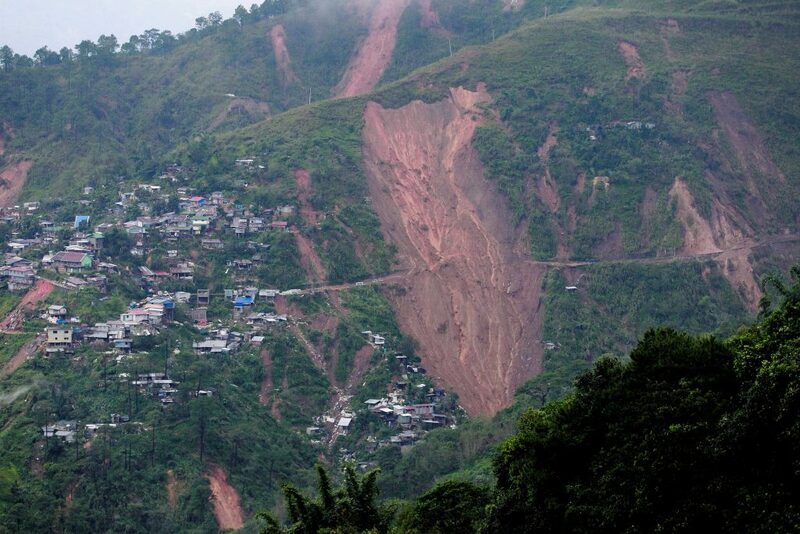 Dozens of people, mostly small-scale miners and their families, were feared to have been trapped by a landslide in the far-flung village of Ucab in Itogon town in the northern Philippines’ Benguet province, Itogon Mayor Victorio Palangdan said by phone. Rescuers were hampered by rain and mud, and the search and rescue operation was suspended at nightfall and will resume at daybreak Monday, Palangdan said. Police and their vehicles could not immediately reach the landside-hit area because the ground was unstable and soaked from the heavy rains, regional police chief Rolando Nana told the ABS-CBN network.